On your arrival to Cochin you will be received by our representative at the airport or the railway station with warm welcome to give you an amazing Kerala holidays . You will get into the cab and we will drop you to the hotel where you can check-in. After the refreshments we will move out in the city to explore various places like Mattancherry Palace, Hill Palace, Indo-Portuguese Museum and Santa Cruz Basilica. In the evening you can go to sunset cruise at Veeranpuzha Beach which covers Chinese fishing nets, Fort Kochi, Bolgatty Island and Willingdon Island. In the night one can enjoy the shopping at streets of MG road or spend the time at Marine Drive. Have an overnight stay at hotel. In the morning, after having the breakfast you can either visit Mangalavanam Bird Sanctuary or pay a visit to the Cherai Beach. Enjoy your day with either the greenery or high tides of the beach. By the late afternoon, we will leave for Munnar which is around 140 km away from the Cochin. On your way to Munnar you can have a halt at various waterfalls which are sure to make your road trip unforgettable. Some of these waterfalls are Vallara Waterfalls, Cheyyara Waterfalls and Attukad Waterfalls. By the night you will check in to the hotel and have a peaceful stay to get over the tiredness of day. After a delicious breakfast leave the hotel for exploring this small yet exquisite hill station. You can go to the excursion of various places like Mattupetty Dam, Echo Point, Gundala Lake, Photo Point and Anaimudi Peak. In the evening or after lunch you can go to Eravikulam National Park, Elephant Rides, Aromatic Gardens and Spice Plantation. Enjoy the leisure night stay at hotel. By having the road trip of around 95 km you will reach to Thekkady. The road is surrounded by picturesque scenic beauty and lush greenery where you can have the halt of your trip for some refreshments. With 3 to 4 hours of journey you will be able to check in to the hotel at Thekkady. Have the lunch and in the evening, have a boating ride in the Periyar Lake. Spend the night peacefully in the hotel. After the breakfast at hotel, with our Periyar holiday packages, you can go for Jungle Safari at Periyar National Park. It will fill you with amusement and thrill as you will get to have a close encounter with various wild life species. In the evening you can explore the local near by places where you can discover the regional culture and values. After the night stay at Thekkady in the morning we will move towards the Allepey. The city of Allepey, that is also referred as “The Venice of East” is over 130 km away from Thekkedy. With 4 to 5 hours of drive you will have the access to the city of backwaters. On your arrival at Allepey you will be checked into the Boat house where you can enjoy the picturesque beauty of backwaters and lagoons. You will have the access to various islands on your boat house cruise. 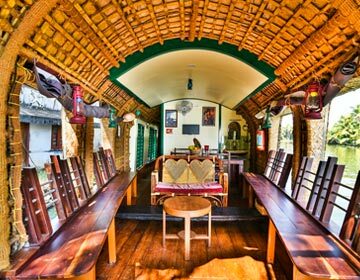 Enjoy the lovely night stay at Boat house with our amazing Kerala holidays. Have the breakfast at hotel and do the local sight seeing at the city. After that we will leave for the “Beach City”, Kovalam. It is at the distance of over 200 km and you will have a splendid road trip of 5 to 6 hours capturing the beautiful glimpses of nature. On your arrival by the late evening, you can visit the sea shores and enjoy the breezy winds along with the delicious cuisines. The city has plenty of beaches like Light House Beach, Hawah Beach and Samudra Beach where you can have fun with sea tides. Around the beach area you can have fun of sunbaths and body massages. Have lunch at the hotel and take a nap. In the evening go around various places like Vellayani Lake, Halcyon Lake, Valiyathura Pier and many more. Stay at the hotel surrounded by exotic scenic views with our Kerala beach packages. Kanyakumari is situated at a distance of 85 km from the city of Kovalam and can be easily covered within 3 hours. On your arrival to Kanyakumari, after the check-in, you will be taken to explore various places like Kanyakumari Beach, Vivekananda Rock Memorial, Thirparappu Falls, Thiruvalluvar Statue, Courtallam Falls. In the evening, sight seeing of various temples and historic sites can be done through our Kerala Holiday packages. Stay in the hotel for the overnight stay. The capital city of Kerala is around 90 km away from Kanayakumari. After the breakfast we will head towards Trivandrum where we can explore places like Neyyar dam and Wildlife Sanctuary, Poovar Island, Agastya Mala, The Napier Museum and Shanghumukham Beach. Enjoy the evening at Chalai Bazar and Sri Padmanabhaswamy Temple. Have a relaxing stay in your hotel at the capital city of Kerala. In the morning, have your breakfast and pack your bags for your next destination, Kumarakom. The distance between both the cities is of 160 km and while enjoying the various places across your road trip you will arrive there by evening. After check in you can enjoy places like Kumarakom Backwaters, Vembanand Lake and Jama Masjid. Stay in the hotel and explore more of the city next morning. After a relaxing sleep and delicious breakfast with our Kerala holiday packages we will take you to the Aruvikkuzhi waterfalls and Kumarakom Beach. By late afternoon we will take you to the Kumarakom Bird Sanctuary, Pathirmanal Island and Bay Island Driftwood Museum. After that you can go back to the hotel and spend leisure time with family and friends. Start your day with healthy and lip-smacking breakfast. After that we will head towards Cochin which is less than a 2 hours drive away from Kumarakom. You can visit either Mangalavanam Bird Sanctuary or the Cherai Beach, whichever was left unexplored on your trip to Cochin. Our Taste Of Kerala holiday package makes sure that none of the gems of this “God’s own city” is left unexplored by you. Stay at the hotel and have proper rest so that you can have relaxing return journey next day. If you have time and want to explore local market then we will definitely take you there. After that we will drop you safely at airport or railway station. Our Kerala holiday packages with budget friendly price are one of its kind. Our representatives put their best possible efforts to deliver you the vacation of your dream. Kerala, the God’s own country is not named among the top ten paradises of the world like this. The state is a complete package for its visitors from enchanting mountain peaks to golden beaches, from lush greenery to awe struck backwaters, it has everything. Our Kerala holiday packages renders you an alluring trip of 14 days where you can explore all the gems of nature. We help you in travelling from hill stations of Munnar to beaches of Kovalam, from Boat house cruise of Allepey to Jungle safari of Periyar, from Elephant Rides to the excursion of Land’s end point of India and from Islands & Waterfalls of Kumarakom to wonders of Trivandrum & Cochin.